It's the middle of January and I'm tooling around Detroit in a two-seat Mazda Miata MX-5 RF convertible. There's something depressing about driving a droptop in the dead of winter. You want nothing more than to fold down the top and feel the breeze in your hair. So I admit I wasn't enthusiastic about stuffing myself, down parka and all, into the low-slung coupe with the retractable aluminum hardtop — until I pressed the clutch and peeled out onto the icy street. Tires make the difference. This 2019 Miata is outfitted with Bridgestone Blizzak winter tires and standard traction control, so in light snow I felt as confident as I did zipping around in the ragtop last summer. The ride is slightly harsher, and a bit noisier, but who cares when you're having this much fun? Mazdas are for people who like driving, so don't expect full autonomy in the future. 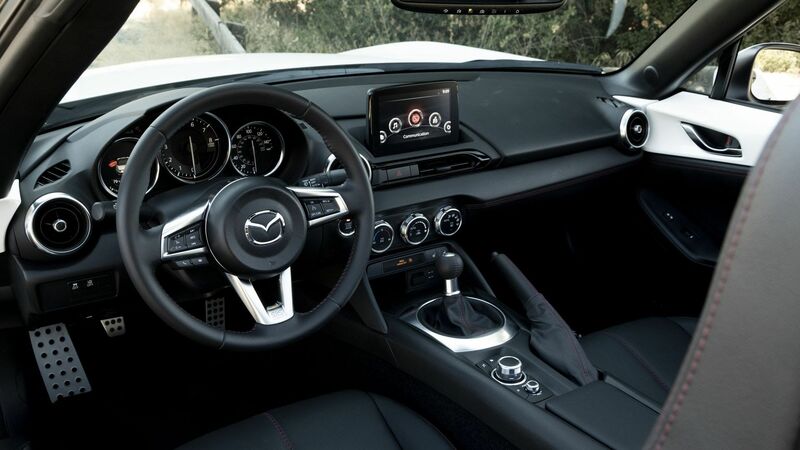 But the Miata RF is available with the usual assisted-driving technology like blind-spot monitoring, lane-departure warning and low-speed automatic emergency braking. The Miata is one of my all-time favorite cars — in summer anyway — the kind of midlife crisis car you'd buy if you had an extra $33,000 lying around. The bottom line: I found myself wishing for a blizzard so I could play around in the snow drifts. Sadly, I had to give it back yesterday, just as a half-foot of snow is predicted. Read what else I've driven here.